If you are celiac or otherwise gluten intolerant, Katherine McMahon’s guide to travelling gluten free in Croatia will help you decide whether you would like to visit this beautiful country. I was diagnosed with Celiac Disease in the spring of 2008 while in my hometown of Anchorage, AK. I currently live in Italy, where Celiac Disease is very prominent and it is unbelievably easy to get your hands of GF food. I was slightly nervous about travelling to Croatia, where I speak absolutely none of their language. After doing some research, I realized that Croatia is well aware of Celiac Disease, as they have both an annual conference and a national Celiac day. However, I discovered that gluten free food items are scarce and expensive, so I decided to take some gluten free snacks, breads, cereals and of course a restaurant card for Celiacs in Croatia. Croatia is quickly becoming one of the top travel destinations in Europe. With its beautiful beaches, sunny weather, and courteous people, one can’t help but want to spend their vacation here. I travelled to the Istria region of Croatia, in the North of the country, close to the borders of both Italy and Slovenia. 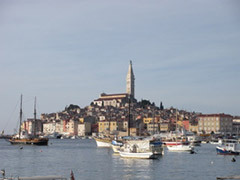 My boyfriend and I stayed in the city of Rovinj for a fantastic four days and three nights. The first day was spent in Rovinj, another in Pula, and the last one in Porec. The weather was pleasant for November, and I even waded in the water on more than one occasion! With picturesque scenery, fresh seafood, and a unique culture, I fell in love with this country and plan to return one day. Croatia, like many countries in Europe, also has a national website for Celiacs that is mostly in Croatian, but here is the letter to visitors, which is in English. My boyfriend and I opted out of staying in a hotel, as most of them have buffet breakfasts which can be highly contaminated. Instead we rented an apartment, which was really cheap since Croatia has yet to adopt the Euro. Once in Croatia, I had no problem finding things to eat. For breakfast I ate from the collection of gluten free food items I had brought with me. There was also plenty of fresh veggies, fruits, meats, etc. offered at the local grocery store in Rovinj. For lunches and dinners we ate out. 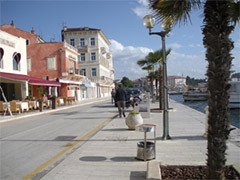 The cuisine in Croatia is strongly influenced by Italy and therefore resembles Italian cuisine. Many of their dishes are comprised of seafood with a little Italian flair. Often they would take the card to the chef and return with the exact ingredients in that dish, enquiring as to whether this item was safe for me or not. One time I even forgot my card and just explained my situation. The waiter totally understood my diet and I had the best meal ever that day! I lived off of seafood risotto, usually followed by a freshly caught fish either baked or grilled served with boiled potatoes and spinach. Sometimes I would add a plate of mussels served in white wine and tomatoes. So if you love the sea, love the sun, and most importantly fresh seafood make Croatia your next gluten free destination. And don’t forget to try the truffle risotto and Istrian ham, as they are both a specialty in Croatia. 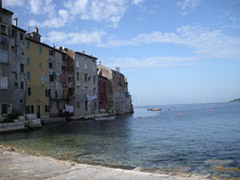 For more information about Croatia or other countries such as, Slovenia, Austria, and northern Italy please visit Katherine’s blog.